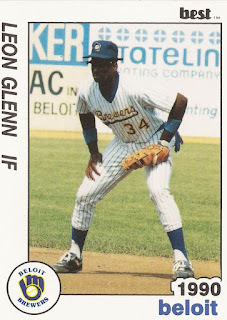 Leon Glenn started strong on his call up to AAA New Orleans in June 1994, according to The Louisville Courier-Journal. He did so by doubling in his first two at bats, The Courier-Journal wrote. He doubled in runs in both the first and the third innings. While Glenn did well enough in that first game at AAA, he didn't do well enough to get that next call up to the bigs. Glenn played nine seasons as a pro. He never made the majors. Glenn's career began in 1988, taken by the Brewers in the 13th round of the draft out of Texas State University. Glenn started with the Brewers in the rookie Arizona League. He got into 55 games there that year and another 51 there in his second campaign. Glenn won the league triple crown both years. He it .340 his first year and .382 his second. Glenn also briefly saw rookie Helena in 1989 before moving to single-A Beloit and returning to Helena for 1990. His average dropped to .211 that year over 107 games. He played 1991 between Beloit and short-season Bend, then 1992 and 1993 at high-A Stockton. He led Stockton with 27 doubles in 1993. He hit one of his 15 1993 home runs in an August game, a two-run shot against San Bernardino. Glenn debuted at both AA El Paso and AAA New Orleans for 1994. With New Orleans, Glenn singled and scored in an August game and walked and scored in a September game. Glenn moved to the Angels system and AA Midland for 1995 and 1996. He singled and scored in a May 1995 game and knocked a two-run homer run in a May 1996 contest. Overall, Glenn .254 in 1995 and .213 in 1996, ending his career.